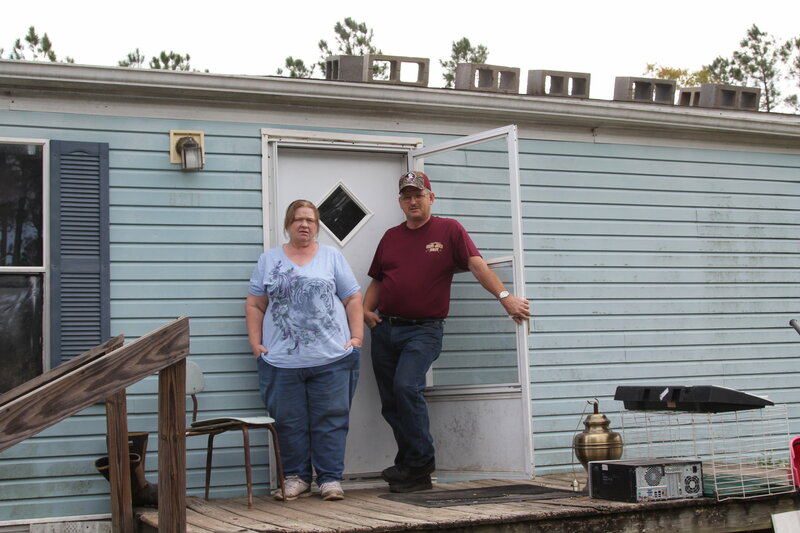 Sandra and Jerry Sloan, who run Sloan’s Wild Game Processing on Highway 301, live less than a mile from the Broadhurst landfill. “It’s wonderful,” Jerry Sloan said, after learning of Republic’s decision to halt a project to dump coal ash into the landfill. “I figured with the money that was involved, it would go on through. I think all the people against it, fighting to keep it out of here is what stopped it.” Photo by Georgina Gustin. This article was originally published by InsideClimate News. Peggy Riggins remembers standing against the wall of a windowless meeting room on a January day last year. Dozens of people sat in folding chairs, others crowded the aisles and more packed the hallway outside, tilting their heads to hear. The Wayne County commissioners were unaccustomed to a big audience. But over the previous weeks, the local newspaper had uncovered plans by an out-of-town waste hauler to expand a rail line leading to the community’s landfill. County residents were getting more and more concerned with each story. This new rail spurwould enable the company—later found to be Republic Services, a $9 billion company based in Phoenix whose biggest shareholder is Microsoft’s Bill Gates—to haul 20 million pounds of toxic coal ash through the county’s swampy forestlands and into the dump every day. Riggins, like a lot of her neighbors, had never thought much about the Broadhurst Environmental Landfill, as it is formally known, and had barely heard of coal ash. But as the news unfolded, Wayne County learned that it could become one of the biggest coal ash dumping grounds in the South, thanks to a loophole in federal law. A retired high school teacher who has called Wayne County home for all of her 65 years, Riggins crafted herself a new job. She met a friend at the Cafe Euro in Jesup, the county seat, and together they began strategizing. Soon after, Riggins came up with a name for the group she would lead—No Ash At All. Soon after, No Ash At All signs poked up from yards across the county. Wayne County stretches across southeast Georgia’s lower coastal plain, a flat, humid sweep of pine forests and mossy swamps, overlaid with creeks and rivers that eventually spill into the Atlantic. The county’s biggest employer, the Rayonier wood-fiber plant, hulks at the eastern edge of Jesup on the Altamaha River—the “Amazon of the South.” Highway 301 cuts through the county’s midsection, past 17 boarded-up motels, once populated by northern “snowbirds” on their way to Florida for the winter. Travelers use Interstate 95 now. From a garbage haulers’ perspective, Wayne County is a perfect dumping ground: it’s relatively poor and out of the way. From an environmental standpoint, though, it’s a particularly bad place to put toxic material in the ground: it’s covered in wetlands and in the middle of a network of waterways that connect every living thing in the county and beyond. And now Republic proposed bringing in trainloads of toxic dust. A waste-hauler pulls out of Republic Service's Broadhurst Environmental Landfill in Wayne County, Ga., in April. The company is the second largest waste management company in the United States, with revenues of more than $9 billion in 2015. The company's plan to bring coal ash into Wayne County stirred up a battle that ended with the company deciding to back out of the project a few days after this picture was taken. Photo by Georgina Gustin. Yet regulators have largely failed to control disposal of this material, which contains arsenic, lead and mercury, even though a person living near an unlined coal ash storage pond bears 2,000 times the cancer risk as those same regulators deem acceptable. For decades, the coal and utilities industries and their allies in Congress have blocked attempts by the U.S. Environmental Protection Agency to create standards for disposing of coal ash. Finally, in 2015, the EPA succeeded in publishing regulations that mean utilities now have to take costly measures to dispose of coal ash, rather than leaving it in unlined ponds. But these standards exempt landfills—and that means that dumps across the country are increasingly being viewed as cheap, convenient dumping grounds for coal ash. In essence, the law created a new market for coal ash disposal at landfills, one that companies like Republic are eager to cash in on. Last year, environmental groups, led by EarthJustice, called for the EPA to require landfills to meet the same standards that utilities have to meet under the new rules. Among them: better liners for the ponds, stricter monitoring, better siting and more public notification. Without those measures, they say, ill-equipped landfills could become as dangerous to the environment and public health as any badly managed coal ash pond. The EPA did not respond to the petition. Because coal ash disposal was unregulated before the new rule—and because municipal landfills are exempt—neither the EPA nor the states have tracked just how much has ended up in landfills. But Broadhurst alone took in at least 800,000 tons of coal ash without the community knowing about it. Residents only found out because a newspaper reporter tracked down the numbers. Some 15 months later, to the great surprise of the anti-coal ash coalition, the community’s campaign paid off. In April, Republic abruptly announced in an email that it was withdrawing its applications for permits that would allow it to haul coal ash into Broadhurst. In January of last year, Neill Herring, a Jesup resident and lobbyist for the Sierra Club, stopped by the squat, concrete-block offices of the Press-Sentinel, Wayne County’s twice-weekly newspaper, and told veteran reporter Derby Waters about an application by a company called Central Virginia Properties to build four rail lines on 250 acres adjacent to the Broadhurst landfill. The purpose of those lines, according to the application, was to bring as many as 100 rail cars of waste to the landfill every day, including “Coal Combustion Residuals”—coal ash. Waters did the math: 100 rail cars translated to a potential 10,000 tons of coal ash. Yet, Central Virginia Properties hadn’t informed anyone in the Wayne County government. Reporters Derby Waters and Candice McKinley looking over some snapshots in the Press-Sentinel's newsroom. Waters wrote and reported the bulk of the stories that revealed to Wayne County residents that Republic Services was planning to bring toxic coal ash into the county dump. Photo by Georgina Gustin. Over the course of the next year, the 6,000-circulation paper published more than 75 stories on the landfill, including three ad-free special sections about the dangers of coal ash. NeSmith fired off nearly 50 editorials and hired lawyers from Augusta to fight Republic. Waters uncovered what Republic’s managers clearly hoped no one would: That Central Virginia Properties was a subsidiary of Republic, the nation’s second largest waste hauler. Republic, Waters learned, had quietly doubled the size of its property in Wayne County to more than 2,200 acres, of which 260 is now permitted for garbage disposal. Waters also learned that Broadhurst had already taken in 800,000 tons of coal ash between 2006 and 2014 from a utility in Jacksonville, Florida, 90 miles to the south. The Atlanta-Journal Constitution, soon after, found that Republic had reported to the state in 2012 the presence of two toxic heavy metals, beryllium and zinc, in monitoring wells at the landfill. But the state never informed the county. Just as troubling was Waters’ discovery of a pair of agreements between Republic and the county, signed in 2005, that appeared to prevent the county from opposing any expansion at the facility—now or in the future. Under the agreement, opposition from county commissioners could prompt Republic to stop paying fees, which at about $750,000 a year are a major source of income for the county. The agreements appeared to tie the county’s hands and made officials reluctant to speak out against Republic. The Press-Sentinel’s journalistic assault lit up this largely Republican community. (Nearly 80 percent of voters cast their ballots for Donald Trump last year.) Neighbors showed up at countywide prayer services and meetings so crowded that dozens had to stand outside. County residents enlisted the help of state lawmakers and environmental advocates from Georgia and beyond. W.H. "Dink" NeSmith (right) talks to a Wayne County resident outside the offices of the Press-Sentinel, the newspaper he's owned for more than 30 years. “The Press-Sentinel did what we believe a newspaper’s supposed to do,” NeSmith said. “If you can’t stand up for the places and the people you love, what kind of newspaper, or person, are you?” Photo by Georgina Gustin. Riggins organized a 27-person committee whose members had an array of relevant skills: a biologist, an expert on environmental impact reports, a social media whiz, a cartographer. They studied maps, enlisted support from fishing groups down river, and even identified endangered plant species in the area, eager to do anything they could to create red tape for Republic. Meanwhile, environmental groups from around the region, as well as lawmakers, took note of the controversy. U.S. Sen. David Perdue, a Republican from Glynn County, downriver from Wayne County, pushed for a public meeting. The Army Corps of Engineers, which was reviewing the proposal to expand the Broadhurst rail yard, extended its public comment period twice. By the summer of 2016, the community felt like its campaign had gained some momentum. Thirty-five years ago, with NeSmith’s publishing star on the rise, he bought 131 acres of land next to the Altamaha River, eventually piecing together a 7-square-mile property of swampland and pine forests. Much of that is in conservation easements now. “I want to leave my kids something they can’t buy at a Wal-Mart,” he said. Southeast Georgia’s web of wetlands, creeks and rivers eventually drains into the Altamaha and Satilla rivers. It’s a soupy, moss-dripped landscape, connected in a beautiful but vulnerable way. What happens at the local landfill happens, potentially, to NeSmith’s land, too. To NeSmith, a scripture-quoting Southern Baptist, this land is church. He often spends the night on his property in a metal-roofed cabin made of cypress pulled from the swamp and watched over by a stuffed bobcat. One day this spring, NeSmith climbed into a jon boat docked near the cabin, just as the Tupelo trees were about to bloom. He rode along the swamp, leading to the Altamaha and the Atlantic Ocean 40 miles away. Snakes draped from tree branches and white ibises lit up the grey-green canopy. “Why wouldn’t you want to preserve this?” NeSmith wondered. NeSmith also began taking pledges for a legal battle, pulling together more than $1 million, including money of his own. “We geared up for a fight,” he said. Republic, based 2,000 miles away in bone-dry Phoenix, put up a fight of its own. According to the Georgia Department of Natural Resources’ Environmental Protection Division (EPD), there are 48 lined Municipal Solid Waste Landfills in Georgia, Broadhurst among them. That liner is required by federal law for “Class D” landfills, which can take in both industrial and municipal waste. Chip Lake, a spokesman for Republic, said that the waste sites are also underlain with two feet of clay, in addition to the liner. The site is fully compliant with all disposal requirements under federal and state laws, Lake said. The location of the Broadhurst landfill is critical. It may be hidden by spindly Georgia pines, but that makes no difference to waters flowing around and underneath it. At a recent No Ash At All gathering, Steve Larson, who is a biologist and recently ordained Episcopalian priest, asked a scientific question in ministerial tones. “There is no more productive area of land than an acre of estuarine marsh, and whatever may happen may not affect anyone in this room in our lifetime,” he said. “It’s not that we don’t need to store this material, but do we need to store it at the headwaters of two pristine, major estuarine rivers? In 2008, a dike gave way at the Kingston Fossil Plant, a power plant in Harriman, Tennessee, sending as much as a billion gallons of coal ash sludge into nearby rivers and bringing the public’s attention to the dangers of coal ash. During the cleanup process, millions of tons were shipped to Uniontown, Alabama, ending up in the landfill of a poor, majority-Black community. The Kingston disaster gave environmental groups ammunition to ask the EPA for stronger protections. Coal ash has never been declared a hazardous waste, thanks to a 1980 amendment, sponsored by the coal and utilities industries’ allies in Congress, which created an exemption under federal law. In 2015, nearly seven years after Kingston, the EPA released a final rule, outlining specific requirements for coal ash disposal at utilities. The new rule requires a utility to close any pond that’s leaking dangerous materials into waterways, to line new coal ash ponds and to place them away from waterways or sensitive areas such as wetlands. Environmental groups were disappointed because the agency did not declare coal ash hazardous waste and the new rule exempted municipal landfills. That made landfills appealing destinations for coal ash, especially from power plants in areas with high water tables or porous rock. The new regulation, in essence, created a compliance-driven market that companies like Republic saw as a business opportunity. Just over half of the coal ash generated in the U.S. in 2015 was recycled, mostly into concrete, a practice most environmental groups support. The great bulk of the ash that’s not recycled ends up stored in ponds at the utilities. Roughly 40 percent of those ponds are in the Southeast. Sandra and Jerry Sloan, who run Sloan's Wild Game Processing on Highway 301, live less than a mile from the Broadhurst landfill. “It’s wonderful,” Jerry Sloan said, after learning of Republic's decision to halt a project to dump coal ash into the landfill. “I figured with the money that was involved, it would go on through. I think all the people against it, fighting to keep it out of here is what stopped it.” Photo by Georgina Gustin. It’s unknown how much coal ash has been dumped in Georgia’s municipal landfills, because until recently state law didn’t require disclosure of what was being dumped, only what state it came from. Last year, the state issued a new rule requiring any landfill that accepts coal ash to develop a management plan, which includes recording how much ash it takes in and from where, according to Jeff Cown, a spokesman for the state Environmental Protection Division. The EPD doesn’t dictate what those plans should include, though it can reject a plan as incomplete. Environmental groups say that’s a huge loophole. They also say that the management plan won’t automatically trigger public disclosure, which means communities may not find out if coal ash is being dumped in their landfill. In other words, the state’s biggest power company will have a lot of excavated coal ash on its hands and hasn’t said explicitly where it’s going—and municipal landfills like Broadhurst have a lot of room to take it in. A little less than 15 months after Wayne County residents found out that Republic was planning to turn their community into a coal ash dumping ground, they were hit with a happy surprise. In an email sent to county officials with the subject line “Broadhurst Landfill Announces Its Latest Good Neighbor Plans,” Republic said it would withdraw applications for state and federal permits that would have allowed the dumping plans to move forward. Republic officials said they wanted to engage the community before making any next moves, including the renegotiation of the 2005 agreement that appeared to tie the county’s hands. “While we continue to believe that the project was sound,” Republic spokesman Lake wrote in an email, “we voluntarily withdrew these permits in an effort to foster a better atmosphere for discussions with the local leaders.” Lake said the company has no plans to dispose of coal ash at Broadhurst in the near future. Wayne County received the news with relief and applause. “Derby should get a Pulitzer,” said Cynthia Morris, a member of No Ash At All. He didn’t. But the Press-Sentinel did win 18 Georgia Press Association Awards for its coverage. Riggins agrees the battle is over but suspects the war will continue. Republic’s top brass could still build the rail line even if the county manages to extract an agreement saying they’ll never bring in coal ash. And that’s doubtful. From Toni Cade Bambara to Janelle Monae, the ArtsXchange has been a home to generations of artists who have shaped the cultural and political fabric of the city. Is Hampton Roads on the edge of the apocalypse? In Hampton Roads, Virginia—the epicenter of both the evangelical movement and climate change—land, ideology, and apathy are losing the battle to a rising Atlantic.